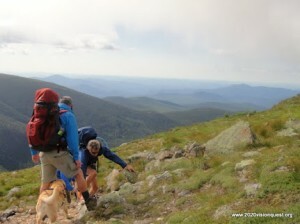 Tags: challenges, Hiking, Inspiration, MtWashington, outdoors, Quinn, Randy. 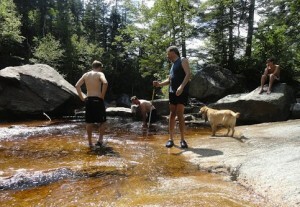 Gem pool at Mt. Washington. Photo courtesy of Tracy Pierce. We seek serenity in myriad ways, and for me it is both in the seeking and the reflection from which I find tranquility. I’ve been asked many times to define the allure of the mountains for me. I’ve asked many the same question and the answers vary from person to person; I find they frequently vary within me as well. In fact, on a single journey into the mountains I often find myself tending several of the experiences which strengthen my spirit. This moment of reflection I dedicate to tranquility, for the recent news of Quinn’s diagnosis of cancer has been storming upon me and I know I must find my calm within the maelstrom. I recall a moment in the mountains, resting upon the side of the trail. My eyes are closed, as this strangely seems to heighten even my awareness of my other senses. There’s a deep earthy scent surrounding me and my back is pressed against the softening remains of a tree blown down by storms long past. Above me, I hear light stirrings of winds playing through the leaves while distantly the higher summit gusts swirl with greater force to sound a symphony of separate swirls in this vast wilderness. I send out my senses to them and dance a bit with the grandness inherent in this vastness. Slowly, ever so hesitant, I draw back my focus to the gentle babbling of a small stream nearby. I allow my consciousness to flow along the sounds of trickling water until it smooths into what I know must be a tranquil pool. There I rest with the calmness and marvel at the gifts surrounding me. I tend the lessons of this forest before returning to the voices of companions on the trail with me. We rise to shoulder our packs and test ourselves further yet already stronger for the respite. Many are the moments of reflection and experience from my journeys. The challenge is to choose to reach out for them when it may seem the world demands are full focus in a less than pleasant present. Each moment we have is so very precious I hope to always find the balance for both building and testing my strength. I wish for all of you the very same. 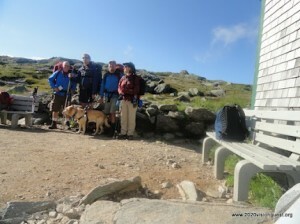 Tags: blind hiker, Eisenhower, Hiking, Monroe, MtWashington, outdoors, Quinn, Randy, success. …And now, part 2 of our hike on Mt. Washington, Monroe, and Eisenhower! 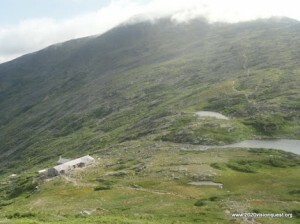 The “higher huts” as they are called can be an amazing experience in the White Mountains. The people who have built and cared for these places created an environment like few others. The crew staffing the huts have a love of the region and are part of the atmosphere designed to make the haven a blend of community, naturalism, entertainment, feasting and rest. This particular hut can host 90 guests and is usually pretty close to this on weekends. 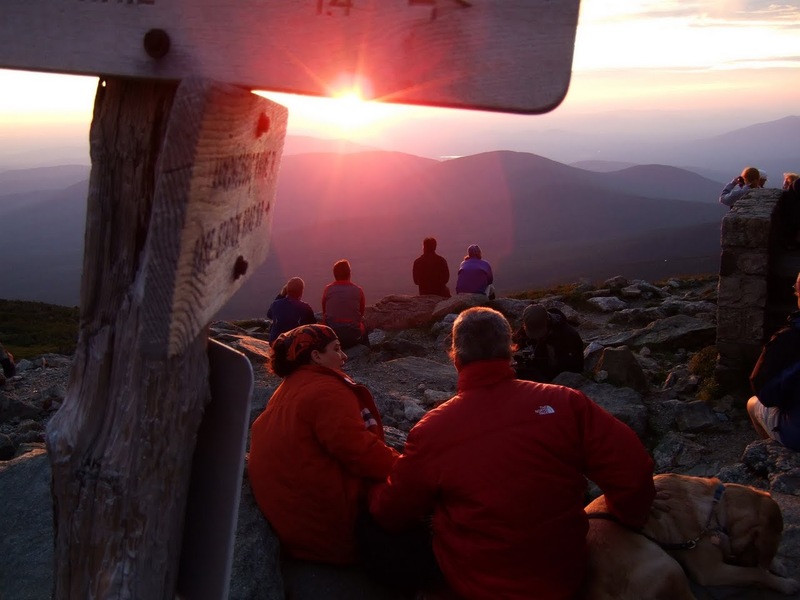 The community of hikers shares stories and experiences while generally reveling in the present experience they are sharing. So too did our group. As the incredible turkey dinner was being served family style, we had time to share a toast as a group. A Nalgene flask of homemade chocolate raspberry port had found its way into my pack for the purpose. “To all the folks who have been part of making this experience possible!” which included the names of all those prior hikers, all the staff of 2020 Vision Quest, and all of the supporting community who keep us inspired to not only choose these experiences but to continue to use them and our other efforts towards our mission. Anything is possible and while success may not come immediately, the determination and perseverance to problem solve, practice, and proceed may lead to moments like this. 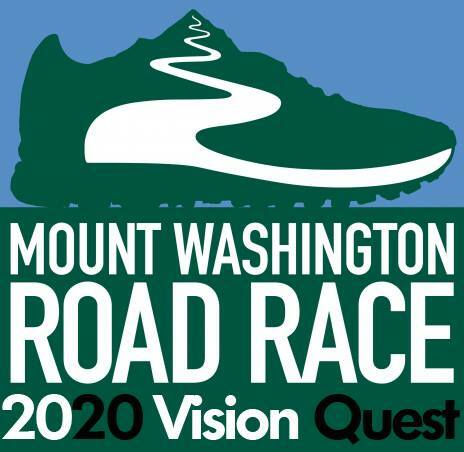 We were going to officially add Washington to our list and this would be the halfway point, peak 24 of 48, in our 2020 Vision Quest goal! After dinner we put on warm gear to sit outside and repeat that magical sunset of 2010, at least in part. 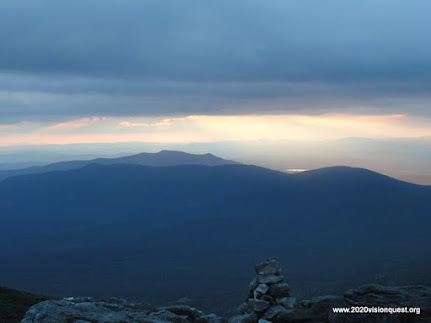 Each experience is different and though the clouds created an interesting “black ray” phenomenon, our westerly view over the seven ranges extending into New York could not hold the intensity of that crystal clear evening two years prior. Neither was the same immense gathering of people present, but the few sitting in the cold winds to marvel had a different bit of bonding and communal appreciation for the majesty of these mountains. 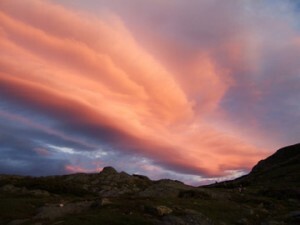 It passed slowly and satisfying before dusk encouraged us to take our weary bodies to bed. Jenifer shared a tale from one of the many books from the hut library: a tale of how the Mt. 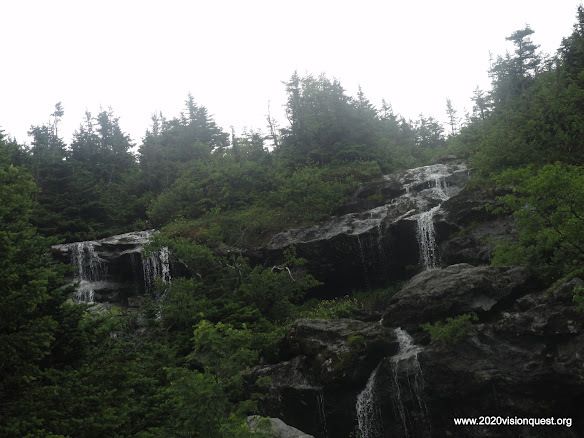 Welch ledges alpine zones became officially and unusually preserved. The circle gardens there did what many other attempts failed to accomplish and was precisely the tale to send us to sleep in our private, comfortable albeit impressively tight quarters. I’ve heard it espoused that bacon goes with everything and apparently it’s true for a staff-inspired performance of Romeo and Juliet. The huts commonly have skits to show guests the best practice “check-out” procedures in a humorous and educational way. Without question, the one we saw the morning after our stay in the huts (a humorous skit inspired by “Romeo and Juliet”) was the best any of our group had experienced. With a hot breakfast of bacon and accompanying goodies in our bellies to match the laughs there as well, we were prepared to say farewell to our hut haven with very warm memories. Whether a hut is right for others isn’t my expertise, but I can tell you the experience has been very rewarding for all of my trips to stay there and the AMC and their incredible crews have my admiration, respect and appreciation! The dense fog of the morning was burned away by a sunny and very windy day. Gusts reached 60 mph pretty quickly as we faced the prominent craggy peak of Mt. Monroe directly ahead of us and the gateway to the Southern Presidential range through which we would hike down to our car spot. As we set upon the short journey to the summit of Mt. Monroe. Cliff took the opportunity to guide along this challenging stretch and within a short time we scrambled up the final section to stand, albeit leaning into the gusts, atop the fifth highest of the 48! The wilderness beyond here was breathtaking and the skies were giving us full appreciation of the scenic offerings. Away in the distance our next and final summit, Eisenhower, was visible with the tallest cairn in the whites clearly discernible. Back towards Mt. Washington, the line of cairns was described as a line of soldier sentries to guide and guard the path to the peak. We needed to continue as we had several miles above treeline and exposed to that wind and the descent would be precarious footing until we cleared a sub peak and reached the Crawford Path. Cliff continued to guide me in these winds and our teamwork grew stronger. At one point, a gust nearly blew him into a dangerous fall save for the steadying of my hand on his pack. A small return for the innumerable crevices and challenges through which he guided me. Crawford path was a fairly smooth pathway on which Quinn was able to guide me at reasonable speeds along the ridge line. Three of our crew took the loop over Franklin to appreciate the look deep into Oaks Gulf while Tracy and I enjoyed some quality time along the easier trail. It’s worth a pause to consider the people who have maintained and still maintain these trails from erosion and work on them so that others can readily appreciate the treasures of these hills. Some of those people are long gone, yet so many modern day trail workers perform their work with insufficient thanks for the incredible service they provide. In 1972, Eisenhower became the more appropriately presidential name for Pleasant mountain. As we endured the intense and powerful winds, we found a small sheltered point to have a quality food stop before the final ascent. We had watched the mountain loom closer for miles and didn’t intend to repeat the prior day’s over-zealous drive towards the hut. We also knew there would be no wind shelter up there allowing us to eat. Most packs were dropped to allow for the final steep ascent. 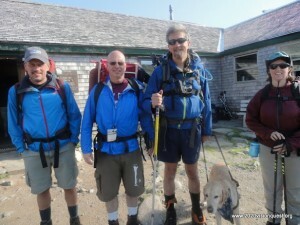 Cliff again guided me and with pack weight absent we made tremendous time to the expansive summit of Eisenhower. There is tremendous space atop this bald summit which makes it a distinctive experience. Mt. Pierce lies directly south after a tree-laden saddle that promised a respite from the win soon. We would take Edmund’s Path and skip Mt. Pierce but the trees would soon be there nonetheless. John took over the guide work as he had his pack and that eases the process of guiding me down. Our 0.8 mile out and back to this summit had us changing our gear, donning our packs and preparing for the final leg of the journey. Trail reports are not always as they appear. Edmund’s path was touted as a beautifully crafted and maintained trail. Perhaps this was once true but at the higher points we crossed a slide that created challenge and some danger with a drop off. We found it rocky, eroded, and challenging for much of the descent into the trees. Even beyond the trees there was work to manage the very wet slabs which typically slanted in disadvantageous ways. Perhaps some of this was the feeling which often comes when the final stretch of the journey is underway. Often, whether due to the efforts expended, the anticipation of the finish, or perhaps the reflections of the experience overall–this portion can become the slog. Conversation quiets and people feel the weariness grow disproportionate to the challenge they are facing. Certainly the trail had eased to the rather decent trail reported before we began to slip out of the slog and begin the full appreciation of our adventure together. 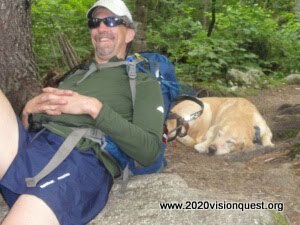 During a break, our “slogging” feelings began to abate as we laughed at the Mighty Quinn’s immediate ability to sleep on a trail and his dubious half awake look when deciding if we were getting up to hike more or if he could catch a few more moments of sleep! 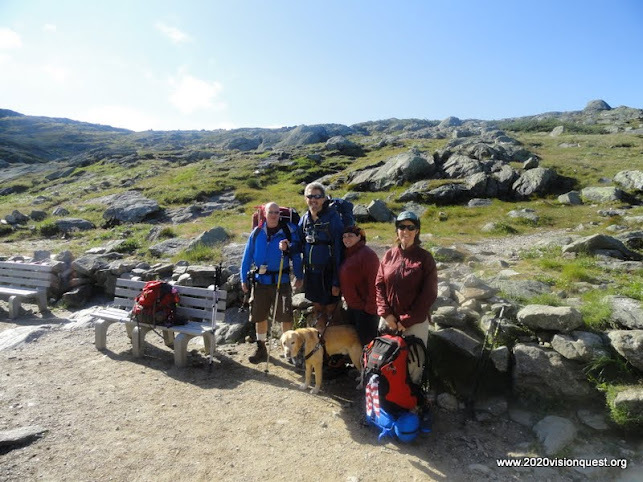 It was exactly the cure to get conversation flowing and the final mile stretch on easy ground for Quinn to Guide me out of the Presidential range! Often we tout the celebratory high five on the summit. It is a glorious experience for certain and worthy of that group celebration. The work there is only partially done as we learned all too well on our last climb of Mt. Washington. The true finish is back at the trailhead when you have achieved the full measure of success. The challenge is overcoming exhaustion, the desire to change footwear, and perhaps even clean up a bit of the wilderness grime! 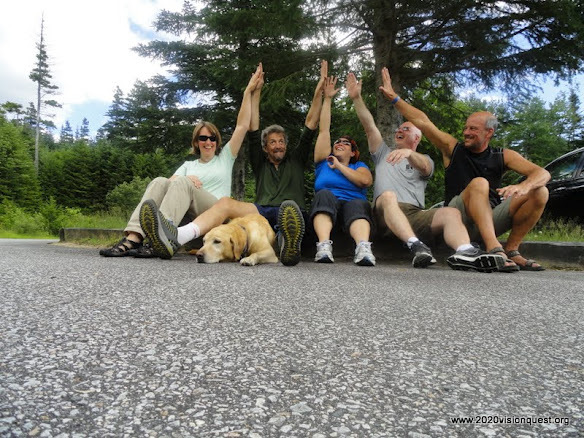 We were, however, so very full of our accomplishments–meaning our groups camaraderie and the desire to celebrate–we had one of our best high five moments to date! This occasion was monumentous enough for all of us to continue the celebration as we packed the one car full, reunited everyone to their own vehicles, and then travelled to savor a post-hike feast together. Stories called out favorite moments while satisfied smiles made it clear how much this group had come to appreciate far more than just the mountain trails we had travelled. 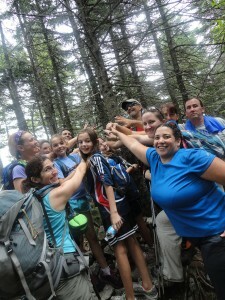 We celebrated something more important than the accomplishment of three significant peaks in the White Mountains. We celebrated each other and the chance to bond through the experience. The goal for me at least is to always reach more people than peaks and that is the real mission accomplished this round. Though I think Mt. Washington, Monroe and Eisenhower were worthy deeds as well! 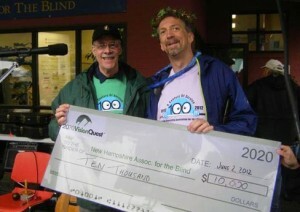 Tags: blind hiker, Hiking, MtWashington, outdoors, Quinn, Randy, success. In 2010, we reached the summit of Mt Washington after a two-day journey loaded with learning and rewarding experiences. (Read about it here.) There was some disappointment in knowing we would not complete the trip with a hike down, but there was a confident determination we would return and fully complete the journey. 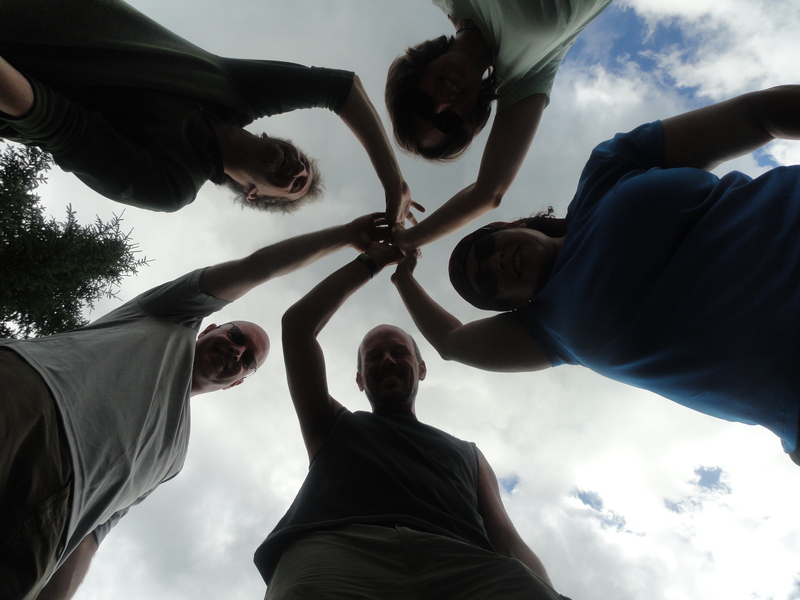 On July 7-8, 2012 we did just that and more in another experience-rich excursion which brought five people and one incredible (some might say mighty!) dog together to finish one leg of the quest. A Banker, Lawyer, Accountant, Author, Blind Guy and a Guide Dog walk onto a mountain adventure and the punch lines await! Before the full group rendezvous, a car was placed several miles away where we expected to return in two days if all went well. We started just a bit after our intended 7:00 a.m. time. Our starting point was from the slightly further, newer trailhead parking lot rather than the cog railway shortcut used last time. The last call of bacon may have delayed the start, but our small group would need all that energy. A steady pace allowed us to meander through simple stream crossings and the quiet trails we had all to ourselves. The boulders made travel a little slower than memories of prior hikes but within a short time we passed the plaque in memory of Herbert Young who died there in 1928–offering a quick reminder of the many perils of Mt. Washington. Putting Gem Pool behind us, we began the steep ascent which would leave heat and humidity behind for the duration of the trip. 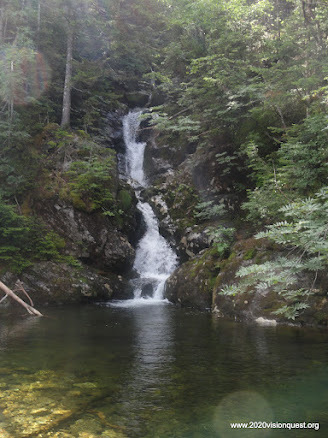 It was there that our cloudy trail allowed the first hikers to pass us as we paused for the Gorge side trail that holds incredibly majestic pools and waterfalls for those taking time to appreciate the side journeys. The mile stretch before the hut is likely the most challenging section of the trail. In past hikes my companions and I had lingered here a long time learning how to navigate such terrain. I had nearly forgotten that first ladder, and yet now learning to put my hands on the trail and use them as my eyes has become a favorite part of taking on the challenge of such hikes. It is here that John Swenson showcased his guiding prowess as he described in a previous report. While Quinn and I can manage this, it is slow and considerably more taxing for both my marvelous guide and myself. As such, our time through the narrow scrambles and across cascades was not nearly as time consuming. 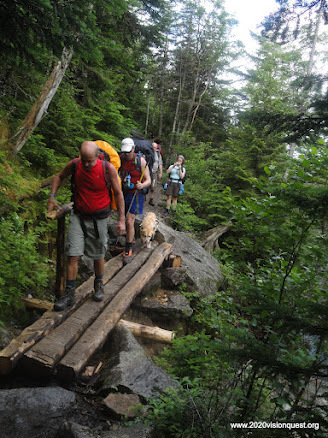 It still required considerable effort and was probably our weariest section of trail. Likely we should have grabbed a more solid food break, but the siren song of the hut for lunch urged us to push a bit too long. It was five hours to the hut and food was a delightful recharge. Packs were dropped and weather reports checked as the ominous cloud banks gave considerable concern. To the summit and back would be 3 completely exposed miles on the rocky ridge entirely above tree line. Lightning with our generally slower speeds would be a risk not worth taking. It was nearly 1:00 p.m. and in order to be at the hut again for the evening meal essential for the rest of our work, we set a turnaround time of 3:30 p.m. for our attempt. The hut provides a direct summit report that suggested we had an afternoon window with low probability if we set out immediately. With nonessential gear left on our bunks (we were staying the night at the hut), lighter packs led to quicker steps and much hope. Nearly half way through the process, the blackness into which we were about to walk suggested a turnaround, but for only a few moments before it began to lighten in the fickle weather patterns for which the region is famous. Tracy took a round of guiding to help increase our speed and passed the job to John for the steepness of the final ascent. We reached the summit in 1.5 hours, although the promised visibility of 100 feet was apparently only partially true. Glimpses of views opened occasionally as the 45 mph winds were as steady as the 45 degree temperatures which felt cooler given the wind. We had achieved the first part of our goal well within the time window necessary. Most of the group had not even felt a single raindrop! The summit buildings allowed for water recharge, a break from the wind, and a short rest as we celebrated the experience thus far and prepared for the final phase of the first day. Climbing down over steeper rock steps is definitely much slower with a Guide Dog, so we put Quinn’s harness in my pack and he was free to roam with us as John led me. Almost immediately the weather took a major shift and incredible views began to open routinely through the cloud cover. 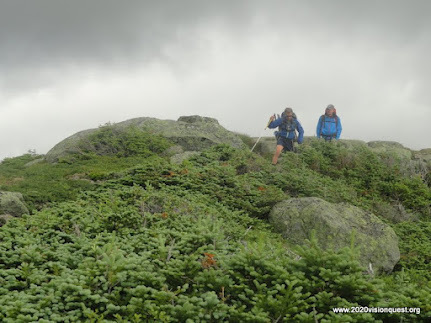 While our entire journey up was within the clouds, the descent unfurled views of the hut and often the vast expanses of the southern presidential range and beyond. With the Alpine Lakes beside the hut in view constantly we had our destination in sight and realized our likely success becoming reality. Conversation was lively to describe and appreciate the views as well as planning for the dinner and celebration ahead that night. The promise of clear and sunny skies for our hike out on Sunday seemed more real as we saw the world from more than a mile high opening in a vast expanse of beauty! Watch next week’s blog post for the second installment of our Presidential Range hike report! Tags: 2020VQ, blind hiker, guest blogger, Hiking, Inspiration, MtWashington, Quinn, Randy, success. 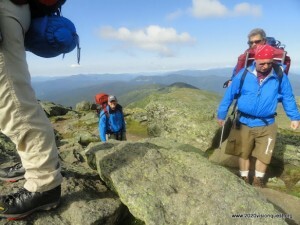 My job this past weekend was to guide a blind man on his journey up Mt. Washington and several other Presidential Peaks. I was to be his eyes on the trails. 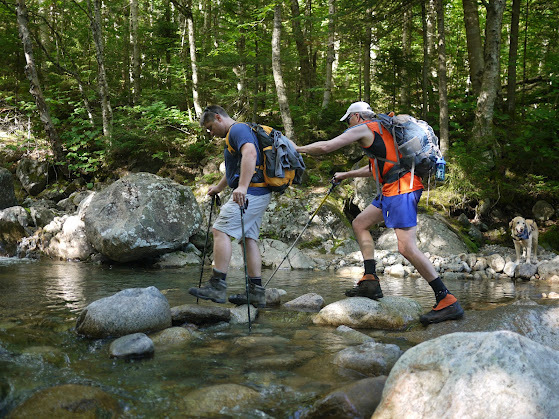 White Mountain trails are strewn with rocks, roots and river crossings and countless other challenges for a blind hiker. I would use subtle and not so subtle signals to protect him from the many dangers such a trip involves. We had done this work before, yet there is always room to learn and perfect our teamwork and communication. Many of you reading this know Randy Pierce and his story and are also aware of the amazing work of The Mighty Quinn. Normally, Quinn guides Randy along these treacherous trails, but on this past weekend’s hike up Mt. Washington and the ensuing traverse across the ridge, there were stretches of trail where Randy asked for assistance from a human guide. It was not that Quinn could not perform the work. Indeed, he has successfully led Randy on many a trail and entered the record books with Randy in March for completing the single season winter 48. Randy requested a human guide this time because a human can move a bit quicker in certain trail conditions and offer verbal communication that Quinn cannot. The end result is hopefully the same–a successful trip–but a human guide can sometimes speed the trip a bit. This is helpful when there are many miles to log. I had guided Randy for brief stints last summer on the Hancock trip and again this spring on the Jackson hike to kick off the 2012 season. I knew that in a small team of five hikers on the Washington trip, I would likely be called on for more assistance than previous hikes and was excited yet nervous about the opportunity. 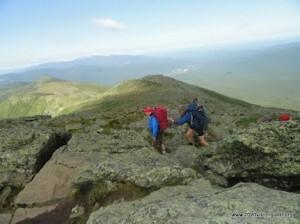 A hike in the demanding terrain of the Presidentials is a workout for seasoned hikers. Add to that the physical and mental demand of successfully guiding a blind man on this trek and the demands and dangers multiply significantly. I was now responsible for my own safety and Randy’s as well. Randy pressed me into service on a good stretch on the upper portion of the Ammonoosuc Ravine Trail. I eagerly accepted the invitation yet quickly realized the demands. The ledges in front of us were steep, smooth and in many places wet. 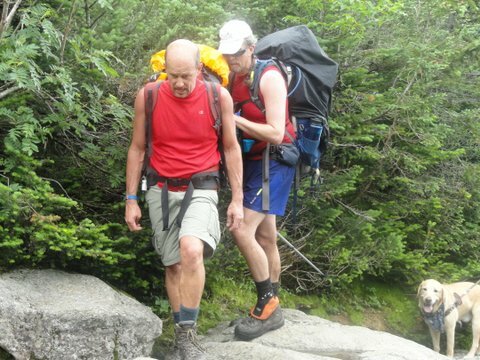 I was looking at them wondering how to approach them myself; yet at the same time; the gentle tug I felt behind me was that of Randy placing not just his hand on my pack, but his trust in my ability to safely navigate the trail ahead of us. As I began to talk Randy through the obstacles ahead of us, I saw every root, every wet rock and the countless crevices and potholes as chances for Randy to slip to a dangerous injury. I instinctively began to warn him of these dangers with explanations such as: “There’s a large slab ahead of us with water running down it and some branches sticking out that might scrape your shin if you go too far left”. I was feeling proud of this detail but quickly learned that in the time it took me to utter such a warning, Randy was slipping, scraping, and stumbling because the key message was not delivered in time for him to adjust for or avoid the hazard. With some guidance from Randy, I learned that “less is more”. Quickly, the above phrase became: “Wet slab; shin bash left”. Randy now had the key pieces of information he needed to deal with the conditions underfoot or overhead. As the guiding on the Ammonoosuc trail progressed, I found myself with a newfound appreciation of the challenges and wonder of Quinn’s work. I was surprised by the additional exhaustion that came from the special mental and physical work involved in being Randy’s eyes on the trail. If it tired me so, how must Quinn have felt at the end of the winter 48? 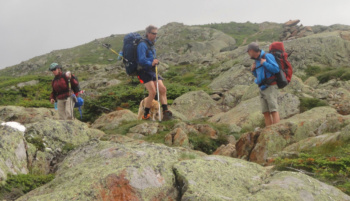 While he eagerly accepts each new hike with that trademark tail wag, there’s no doubt that he is also tired at the end of his day guiding Randy in these mountain quests. Quinn cannot warn with a “Stop while I assess our approach to this” or a “Take this section slow; lots of loose rock ahead”. Quinn’s tools are body positioning, cadence, and gentle tugs and nudges. How immensely difficult and yet how effective this communication has been for Randy. Less truly is more. 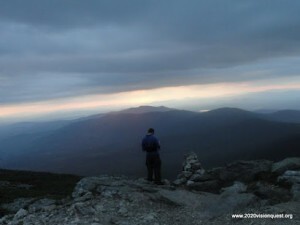 On Sunday of our trip, we journeyed across the Crawford Path from Lakes of the Clouds Hut to take in Mts. Monroe, Franklin, and Eisenhower. Each of us in the group had our stint of guiding for portions of the trip. Cliff offered to take some of the uphill challenges and I accepted a number of downhill shifts. We descended from the ridge via the Edmands Path and our afternoon was filled with much lively conversation. At one point late in the day, Randy was quite engaged in conversation as I guided him and although I could interrupt him to warn of dangers ahead, I found myself wanting to minimize interruptions so he could fully participate in the dialogue. A short while later, we were discussing how my guiding had changed in two short days from the overly detailed communications I described above to the “less is more” approach. I realized, and Randy observed, that I had just guided him for a good length of trail without uttering a word. I had become Quinn-like in my guiding, using body positioning and speed to communicate without speaking. When there was a step down, I sometimes exaggerated it a bit with my step so that Randy would sense the need to step down. If the footing became rougher, I would slow my pace as I hiked through so Randy would pick up the need to move carefully. If we had a water crossing, I would stop while I assessed approach and in so doing, the stop signaled Randy to be alert for more guidance. I have been impressed with the work Quinn does since Randy first shared it with me a few years ago. After two days watching Quinn work in his quiet effective manner and experiencing my several opportunities to be a human guide dog, my respect for what Quinn does and for the way he communicates with Randy have reached new heights. While I look forward to my next tour of guide duty, I will forever tip my hiking stick to the work of The Mighty Quinn. Tags: 2020VQ, blind hiker, Hiking, Motivation, MtWashington, Quinn, Randy. Gorgeous sunset on Mt. Washington. 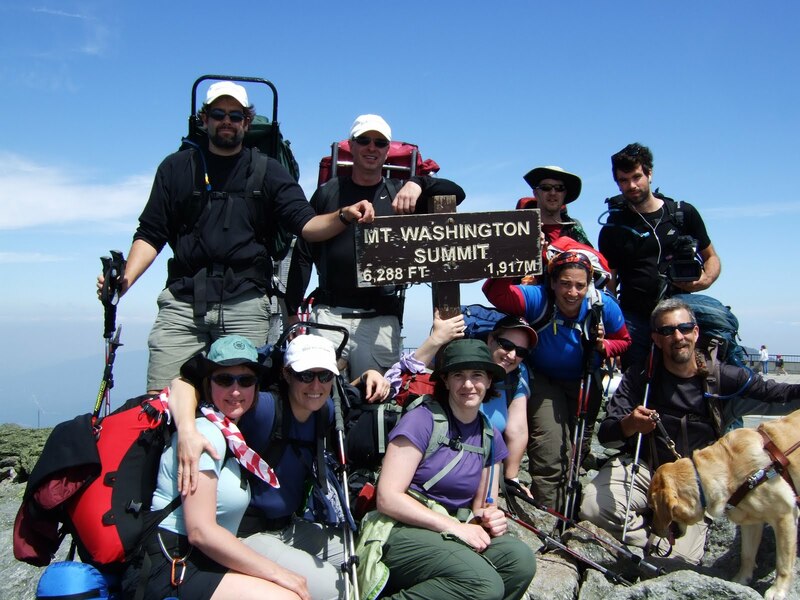 Ultimately though we reached the summits of both Monroe and Washington, neither count as success in our pursuit of the 48 because as a group we decided we could not reasonably hike down the mountain in the time we had remaining. It was a bittersweet start to our project. Since then we’ve put 23 of the 48 into the success column and are now poised to leap over the halfway mark with an early July return to both Monroe and Washington once again. We have learned a few lessons and skills along the journey and feel very confident we have a much better likelihood of reaching our goal on this expedition. Certainly some might suggest our winter accomplishment makes this a near certainty, but our recent hike on Mt. Jackson reminded us how much more challenging the experience is without snow smoothing the trails for us. 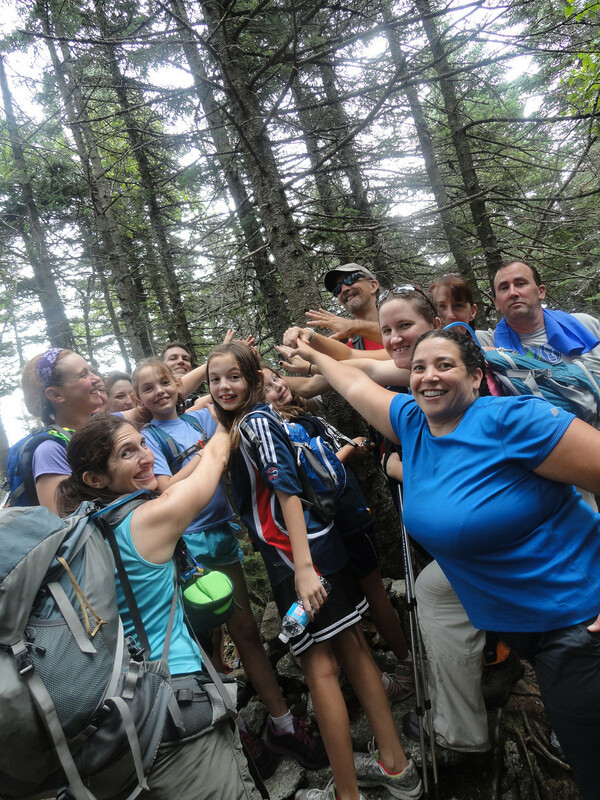 Our July 2010 scramble up the Ammonoosuc Ravine Trail on Mt. Washington took us over 8 hours from start to the Lake of the Clouds hut. In the winter that journey was an astounding 2 hours into incredibly majestic views and an unrivalled feeling of accomplishment. I understand the time-sensitive work required to the gem pool, up the steep steps of the Ammo to the “Avocado Falls” overlook. There it will be a hands-to-the-ground scramble to reach the hut and ideally before noon to ensure we can reduce our packs and prepare for the 3-mile round trip to the summit on that same day. All aspects of the weather will impact our chances and as always with the crown jewel of the white mountains, we must be prepared to change/adjust/cancel any aspect of this journey. Still, I know what I know of every experience–I succeed already when I make the choice to undertake and properly plan such an endeavor. I cannot tell you anything other than my fervent hope and intent to celebrate success, independence and a tremendous feeling of freedom! 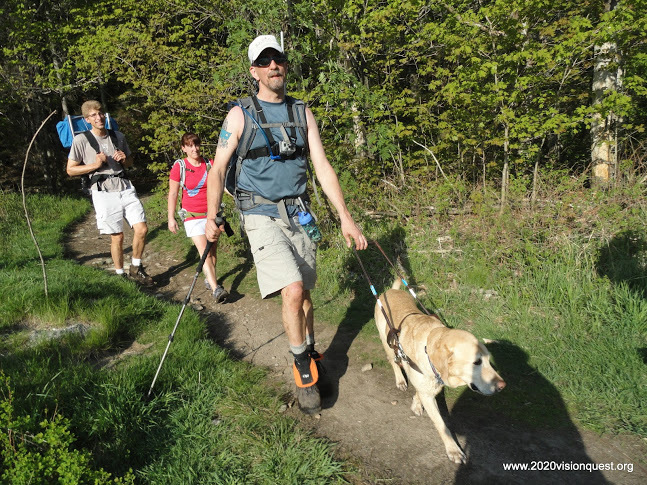 Tags: 2020VQ, Hiking, MtWashington, Randy, Support. I wanted to share a personal reflection on an article I read in the news yesterday. The article talks about the tragic death of Christopher Baillie. This young and healthy 24-year old was dedicated to several philanthropic efforts, had already battled cancer successfully, and by all accounts in the many tributes on his Facebook page, was simply a wonderful person. As he pursued his personal dreams, he explored the wonders of the wilderness, and it was in this pursuit that he fell to his death on Mt. Washington’s Tuckerman’s Ravine Trail. Life is fragile, and as we try to live in manner that is rewarding to us, we should remember that each appreciation is a precious gift. I did not know Christopher personally, but I understand a bit of the spirit with which he lived. I was particularly touched when I read a tribute left by one friend, Sean Harkins, “You already made the summit and went far past, overcoming everything life threw your way.” It speaks volumes of not only Christopher’s character, but also of his ability to appreciate his journey, albeit a journey brought to an end too suddenly. We all experience risks and challenges, whether we’re on Mt. Washington or elsewhere. I hope most of us can remember to appreciate each step along our own personal summits. Tags: 2020VQ, Hiking, MtWashington, outdoors. Hiking with Randy and the large 2020 team translates, understandably, to very little “couple time” for us on the trail. Between the team, which is made up of friends, and all of the cool new people we meet along the way, Randy is in high demand. In everyday life we get our fair share of time, so on hikes I try to step back and allow those who don’t usually get as much interaction with Randy to spend time with him. To account for this we tend to aim for some end-of-day, quality “us” time. At Lakes in the Clouds hut we decided that sunset would be that time. Randy asked me to find us a great vantage point from which we could share the sunset together. I found a comfortable perch near where a large number of other hut guests had gathered, and we settled in to see what Mother Nature would share with us. She had been busy that day; we’d marveled already at beautiful cornflower blue skies, wispy clouds and amazing waterfalls. I wasn’t sure that the day’s visual delights could be topped. The atmosphere of the crowd’s excitement for the upcoming sunset was palpable and similar, ironically given the date of July 4th, to a crowd’s mood just before a fireworks display. Obviously, the day’s gorgeous weather had folks keyed up and expecting a fantastic display. We were not disappointed. 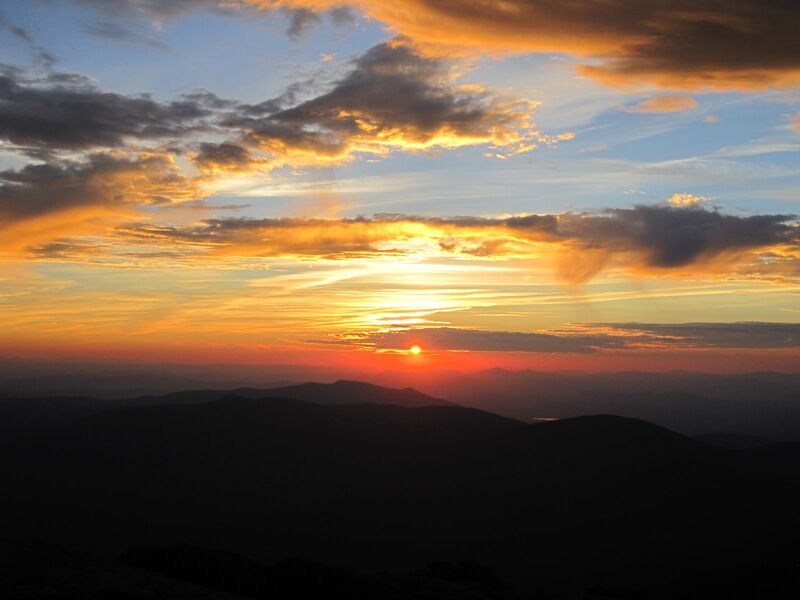 Some of our companions captured outstanding images of both the sky to the West and an interesting array of clouds to the East; however, they are mere shadows of the beauty of this sunset. I despaired that my words of description were inadequate in conveying the magnificence of the sunset to Randy, but he could feel the quiet awe of those around us. When something is so beautiful as to silence that many people, it has to be powerful. As the sun finally nestled behind the far horizon the silence gave way to applause. Yes, we applauded a sunset, it was that amazing. If I could choose a moment to share with Randy and to keep in our memories together forever, this one certainly would be one of my choices.